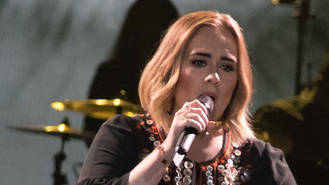 Adele was been forced to cancel her Wednesday (17Aug16) night concert in Arizona as she battles through a nasty cold. The Hello singer was feeling under the weather when she brought her Adele Live 2016 tour to Phoenix's Talking Stick Resort Arena on Tuesday (16Aug16), and by the following day the illness took its toll on her and she knew she had to axe the second scheduled performance at the venue. In a video posted on Instagram just hours before she was slated to take the stage, a stuffy and lethargic-looking Adele said, "Hello, everyone, specifically everyone in Phoenix, Arizona. I can't do my show tonight, my second show here. I'm really, really sorry. I've had a cold for a couple days, and I've been pushing through it. And I did my show last night, and I loved it. But I pushed too hard and my cold has gotten the better of me. And, as you can hear, even if I did the show, it wouldn't be very good." "I'm really, really sorry to let anyone down," she continued. "I've enjoyed my tour so much and cancelling shows is not something I want to do... I've been trying to sing all morning, and warming up, and nothing's really happening... It's the last thing I want to do, but I have to look after myself, because I've got so many more shows to do." Adele concluded, "I will reschedule the show I promise you I will come back and smash it for you. I'm really, really sorry. Have a wonderful night without me!" The Grammy winner only kicked off the North American leg of her tour in July (16), and she will continue to tour throughout the U.S., Canada and Mexico until 15 November (16). Organisers of this weekend's V Festival in the U.K. have dismissed reports suggesting Justin Bieber has pulled out. Mark Ronson is "beyond gutted" he had to cancel a DJ gig in Hong Kong due to visa issues. Drake has scored 14 nominations for the 2016 BET Hip Hop Awards, putting him in the lead for the third consecutive year. David Gray is releasing a Greatest Hits album titled 'The Best Of'. Stooshe are hoping to fly out to the Caribbean with Beenie Man to film a music video for their song 'Shots Fired'. Sir Paul McCartney has signed a new deal with Capitol Records. Grimes says being a "successful" artist is "90 per cent luck". Madonna and her 16-year-old son put their past squabbles behind them to celebrate her birthday in Cuba on Tuesday (16Aug16).